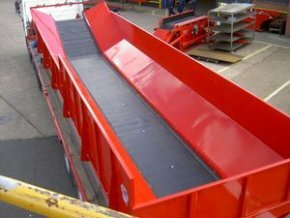 This reception hopper is desgined to have the contents of a trailer or bucket tipped into it from the side. The tailgate is also removeable so that it can be filled from the rear. This model has high sides on to increase the holding capacity. Standard width of this hopper is 2.4 meters. Belt widths are 1050 mm, 1200 mm, 1800 mm and 2400 mm. Belts are supported on Renold heavy duty 4" pitch roller side chains with a breaking capacity of 15000 lb. Belts are thick reinforced rubber (not thin PVC) and have vulcanized vee cleats to assist the emptying of the hopper and to prevent crop slippage on the belt. It is suitable for a large variety of crops.